StorySave is a program of Storytellers of Canada / Conteurs du Canada recording the voices of elders from the Canadian storytelling community. Those voices are then made available to listeners world-wide as part of a living legacy through our website and through the production and sale of CDs and/or other recordings. Nominations are welcome for all storytellers who have made a significant contribution to the storytelling world. Only those nominees who have developed a marked personal style to the craft of storytelling, including but not limited to their vision, technique, interests, influence, history, and specific repertoire will be considered. 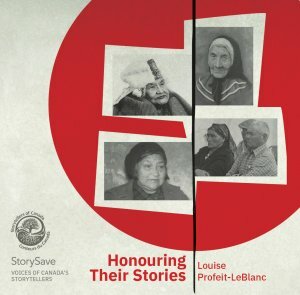 Each year, a jury of StorySave Committee Members will select the person(s) who will be the next “teller” to be recorded from the nominations received. The StorySave Chair presides over the deliberations. That there is a production committee in place, ideally one that is local to the nominee, dedicated to seeing a SS project through to successful fruition. With the support of the StorySave Project Manager, the committee works on technical aspects, fundraising, production, launches and other necessary local details. You may nominate a teller using the online form available on the SC-CC Members’ website. All nominations must be received no later than midnight October 31st EST. The committee will make a decision no later than December 1st. The person will be notified, in writing, in late December, and their name will be announced at the SC-CC Annual Conference. Please provide a statement on why the nominee should be considered by the StorySave Committee. The statement should be a maximum of 250 words. If available, please provide a CV for the nominee.